Isthmus Wellness offers therapeutic infrared sauna therapy. Infrared sauna detox has received significant mainstream attention as resent studies suggest that common illnesses are caused by the build-up of toxic substances in the body. Reports from the United States Center for Disease Control estimate that over 80% of all illnesses have causes rooted in personal environments or lifestyles. In an industrialized society, we can do little to reduce exposure to toxins in the air we breathe and the food we eat. As a result, sauna detox has become a leading treatment to achieve greater health and wellness. Researchers have long known that toxic substances, including heavy metals, are secreted from the body through sweat. Therefore, the more one can safely sweat (while maintaining proper hydration), the greater quantity of toxins will be released from the body. Infrared sauna usage is one of the most effective methods of inducing a detoxifying sweat. In a sauna detox, sweat carries toxins out of the body through the pores. But not all saunas are the same. The far-infrared heat generated by an infrared sauna produces sweat that carries nearly 20% toxins. In a traditional sauna, you can only expect up to 3% toxins. As such, a sauna detox in an infrared sauna is up to 7 times more effective than in a traditional sauna. 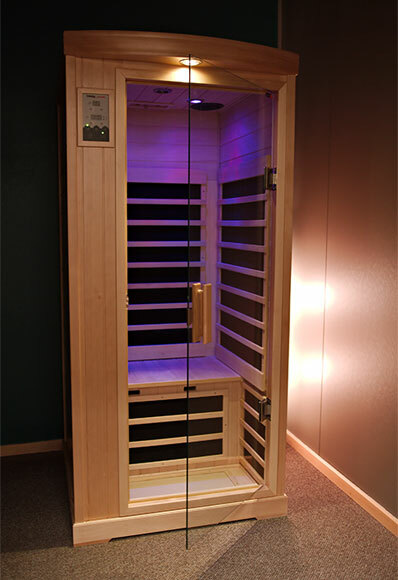 This incredible detoxification is accomplished through proprietary and highly efficient infrared heating technology. Infrared heating technology is clinically shown to actually raise core body temperature by 2 to 3 degrees (vs. simply heating the air around the body). As a result, regular usage of an infrared sauna provides a truly deep, productive and detoxifying sweat at the cellular level, where toxins reside. Finally, a 2003 study conducted by the Department of Dermatology and Institute of Medical Research showed that use of near-infrared heat therapy helped the production of white blood cells to alleviate inflammation and reduce swelling, two key factors in easing bodily pain. (3) Again, only mPulse’s heating technology is scientifically proven to deliver these types and levels of therapeutic near-infrared wavelengths. If you’re looking to lose weight, Sunlighten can help. In a recent study, our saunas were shown to promote weight loss by burning calories while you relax in total comfort. It is no secret that maintaining a healthy weight is important for overall quality of life. In fact, a 10-year study published by The New England Journal of Medicine found that waist circumference by itself is a critical factor in assessing the risk of premature death. In other words, if you can maintain a healthy weight, you may increase your likelihood of a longer, healthier life. (1) Internal Medicine (Tokyo) Aug 15, 2008 by Matsushita K, Masuda A, Tei C. The First Department of Internal Medicine, Kagoshima University Hospital, Kagoshima, Japan. (2) Whelan et al; The NASA Light-Emitting Diode Medical Program- Progress in Space Flight and Terrestrial Applications. CP504, Space Technology and Applications International Forum-2000, edited by M. S. El-Genk. Copyright 2000 American Institute of Physics l-56396-9 19-X/00. (3) Lidija Kandolf-Sekulovic, Milena Kataranovski, Milos D. Pavlovic. Immunomodulatory Effects of Low-Intensity Near-Infrared Laser Irradiation on Contact Hypersensitivity Reaction. Photodermatol Photoimmunol Photomed 2003; 19: pp 203–212, Blackwell Munksgaard. (4) Dr. Richard Beever BSc, MD, CCFP. Do Far-Infrared Saunas have Measurable Health Benefits? A Sequential Longitudinal Interrupted Time Series Design Study. 2009. Dr. Richard Beever BSc, MD, CCFP. Do Far-Infrared Saunas have Cardiovascular Benefits in People with Type 2 Diabetes? Canadian Journal of Diabetes 2010; 34 (2) :113 – 118. (5) Dr. Masakazu Imamura, MD, et al. Repeated Thermal Therapy Improves Impaired Vascular Endothelial Function in Patients With Coronary Risk Factors. Vol. 38, No. 4, 2001. Journal of American College of Cardiology: pp 1083-1088.